With the winter weighing heavy on our minds, and with all of us suffering vitamin-D deficiencies, it’s hard not to think of the outdoors being lovely and summery and what landscaping projects you can take on to optimize the livability of your backyard. Thus, we figured we’d hit you before the rest of the home improvement blogs and chat about what your spring and summer yard can look like with some of the cool new outdoor lighting tricks that will set your daydreams of warm nights alight. Outdoor lights are a creative way to spruce up your backyard without breaking your bank, most of the time. Good lighting can alter the entire mood of a room, hence why they use it on stage productions, it can entirely change a space. So use it to change your backyard into the ideal space that you’ve always dreamed of with these new trends. LEDs are on the rise everywhere and for a good reason. They’re extremely reliable, hard to break, and save energy. You could easily say LEDs are the lighting of the future, so it’s no surprise that most lighting designers recommend them as a top choice for your backyard space. They’re also super varied so you can choose based on the effect you want and the style and design without much hassle. There are also reflector lights to choose from, which you might lean toward if you need quite a lot of lighting in your outdoor space. Besides these two main options, you could also seek out the less popular low-voltage lighting. It’s popular among energy conscious folks because, while the average home uses 120 volts of power, low-voltage lighting rings in at around 12 volts. They’re very effective for up-lighting or down-lighting, which is essentially placing a light above or below something to bring careful emphasis to the object. Mounting lights, might not sound difficult but at times, it can be complicated. It’s where you’ll find all of your zen and atmosphere, so it’s a crucial piece. Try using pictures of scenery you like to try and recreate the lighting points, it’s going to definitely be a trial and error activity. In regard to outdoor lighting, be sure that you’re providing enough illumination while avoiding putting them in strange places that won’t flatter the architecture of your backyard. As a rule of thumb, try to avoid placing them inside plants, drilling holes, or disrupting plants at all. Doing any of this to your plant life is going to promote a healing response and the plant may purposely grow around the light as if trying to heal a wound. If you feel the need for the light to be placed on a tree, try placing it on the tree with a strap device. They can be made of nylon or cloth and generally come with a type of clip-on device that can be constantly adjusted over the life of the tree. There’s also the trusty in-ground light, or just place the light at the foot of the tree. For in-ground lighting, there are some portions that you can do on your own such as installation which we’ll walk you through in this blog, but you’ll need a licensed electrician to wire underground lights. To begin, dig an 18-inch hole where you’d like the light placed. Backfill with gravel to ensure there’s decent runoff for excess water that would otherwise crowd around the light and cause electrical failures. Then, insert the cable into the hole, allowing enough cord to connect to a power source. Your light should come with plastic housing, at this time, insert that into the hole. You should be able to install the light itself at this point. Some come with fashionable lenses that add to the overall aesthetic and functionality of your device. Those would be installed at this point as well. Now you’re ready for a local electrician to come do the dirty work for you! 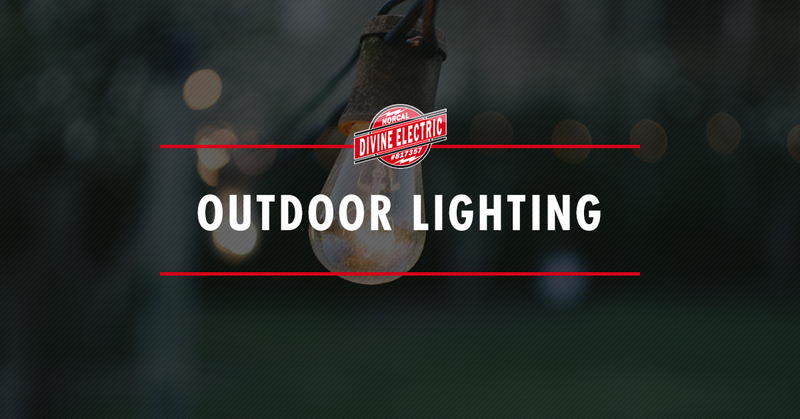 Give Divine Nocal Electric a call once you’ve picked out your mulch for covering the wires and we’ll help you devise a dynamic plan to get the most out of your backyard lighting. If you need any help with setting up the electricity in your house please feel free to contact Divine Electric Nocal, we’re so proud to serve the Marin County. Be sure to check out our blog for more tips and tricks on how you can optimize the lighting of your house for mood and efficiency. If you’re in need of a consultation, don’t hesitate we’re prepared to come and form a plan that best fits your budget and hopes for your home. We’re excited to be your trusted local electrician.